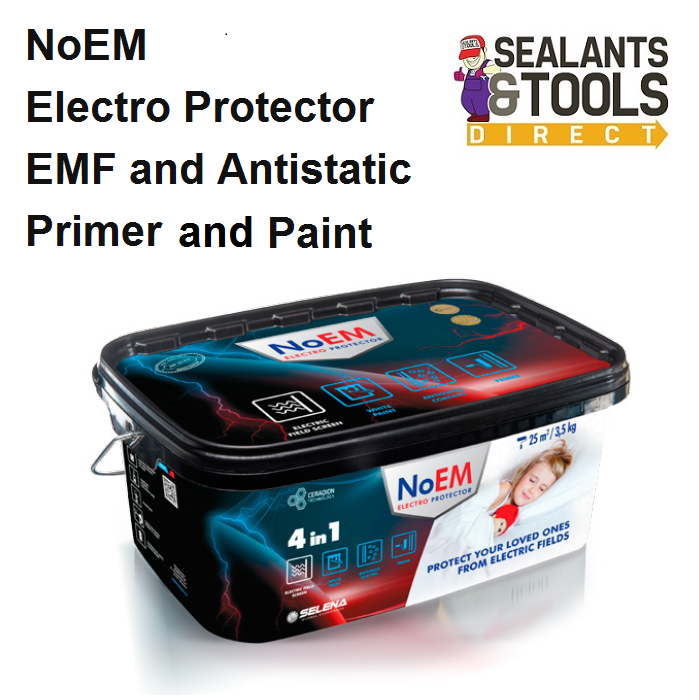 NoEM Electro Protector Sheilding Primer and Paint is a product designed to protect against sensitivity towards the harmful effects of Electro Magnetic Frequencies. Sealants And Tools Direct are proud to be an exclusive UK stockist and distributor of this EU legislation compliant product. Attempt to ground with nature's design of the earth. EMF makes it difficult for our bodies to regenerate when we are asleep as it disrupts the DNA rebuilding process, which is crucial to our health. EMF is absorbed by the water contained within our bodies. A child’s body absorbs more of the harmful EMF as it contains more water than of fully developed adult.Electrical equipment, wiring and installations within the walls emit waves, which penetrate a child’s nervous system. 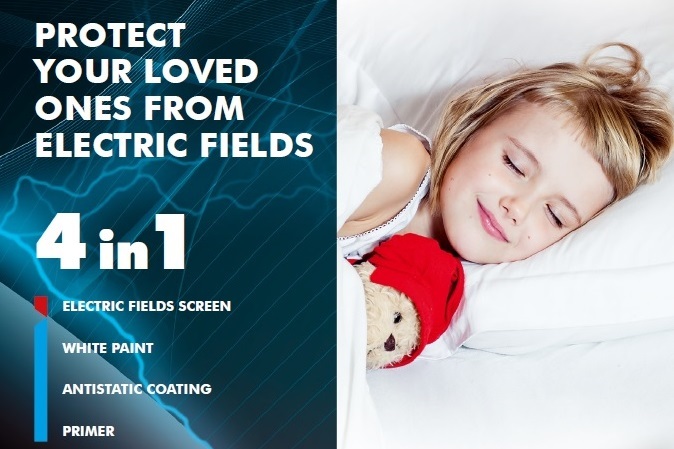 The NoEM Electro Protector screens this harmful EMF by absorption ensuring a safe and healthy nights sleep for your child. Designed to reduce and protect against Electro magnetic frequencies around the home or business premises. shielding properties screening for up to 10 years." EU Directive regulates the EM Field exposure levels in the work place and the need to maintain an appropriate ‘electrohygiene’ in a work place has been highlighted by many international organisations such as the European Union. The EU Directive of the 26th of June 2013 sets out a minimum health and safety requirement to protect workers from electromagnetic fields. New safety laws are to be implemented by the EU Member States (including the UK) by the 1st of July 2016. This EM Field directive completely changes the existing rules for protecting against EM Fields for UK companies. NoEM Screen – The interior primer is supplied and available ready to use. It must not be mixed with other substances. If necessary, the paint may be diluted, with water to a maximum of 5%. For the best screening results you should ensure that the humidity in the room is greater than 35%. The ideal relative room humidity, which is most beneficial to your health is 60%. The surface should be clean, degreased, dry, stable, sound and free of stains and efflorescence and any other substances reducing adhesion, especially dust, dirt, wax and grease. Old coatings and other poorly adhesive layers should be carefully removed before applying any coat. (This is particularly important when painting over glue and lime paints). Surfaces covered with fungus and mould should be carefully cleaned and washed thoroughly and then secured with an appropriate fungicide. Any dents and defects should always be filled with the correct type of filler first. Freshly built, highly alkaline cement or lime substrates should only be painted after at least 4 weeks and with gypsum plasters after a 2 week period of seasoning. The product is ideally suited for coating of absorbent surfaces such as plaster boards, gypsum and plaster. All products for preparation of the substrate must be used in accordance with their user manuals. Surfaces not destined for coating such as furniture on doors and windows should be protected covering any plastic/metal parts. The interior primer must be applied on a clean surface. It works immediately after applying the first coat. It can be brush or spray painted. It should be applied in such a way to ensure an even and smooth coating. A second coat can be applied to maximise the electric field screening efficiency. Once the first coat is dry, it should first be applied using the “cross stroke” method and then one consistent direction of painting to ensure a fine finish. Application should be completed for each area without breaks to ensure a consistent coverage. The ideal temperature in the room, the prepared surface, for the product and for drying should be between +5°C to + 25°C. Drying time at +20°C with a relative humidity of around 65% is approximately 6 hours. (A low temperature and/or high humidity will elongate the drying time. Tools should simply be washed thoroughly with water).